But especially Happy Mother’s Day to my mommy. 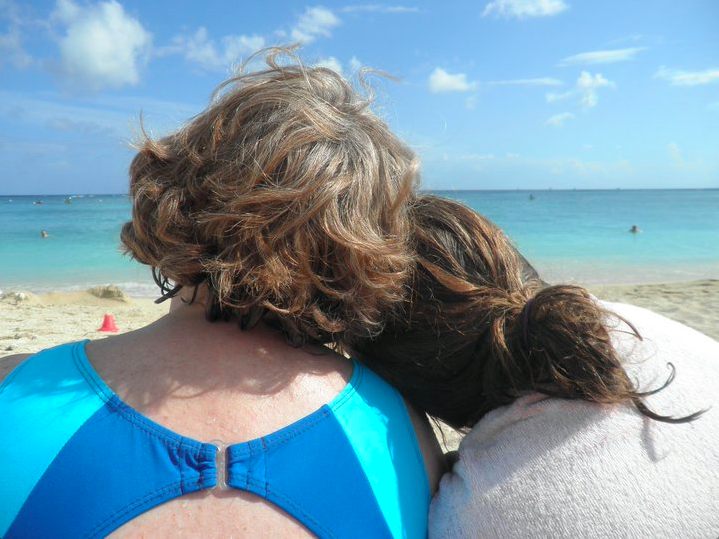 I’ve blogged about my mom before for her birthday. I could blog about her for the rest of my life because she’s just that wonderful, but in order to get everyone to brunch, I’ll keep it relatively short. Every summer she always has a list a mile long of changes she wants to make on the house, gardens to plant, vacations to take, books to read, and, of course, spending most afternoons at the pool. Now, usually this doesn’t all get done. (Sorry, Mom.) However, an amazing amount of this list is accomplished because my mom is always going and always making time for the “most afternoons in the pool” part. I was going to tell a story about me calling Mom daily from my high school teacher’s phone to apologize for being snippy on the way in, but I actually think that says more about me (though it was probably inherited from her). Instead, I want to talk about two moms in stories I’ve read/seen lately. The mother in the book is sad. She’s sad about her place in life. She’s sad to be a mom. Now, I know I’m talking about being a mom when I’m not one, so feel free to shove the screen away. But I am talking about this from the perspective of growing up with a mom who made me feel really, really wanted. Now, to be fair to the mom in the book, she goes through unspeakable tragedy in her daughter’s death. (This comes out in the first ten pages.) But it becomes clear throughout that she didn’t want any of this mother business. I understand. Well, the best I can, I understand. Don’t all moms sometimes feel trapped? Feel inadequate? Feel like their kids took everything good from their lives? Anyway, I get that moms don’t always feel like supermoms. But the mother in that story leaves her family. And there was something missing there that I couldn’t figure out. Like, it asked a question, but it gave the “wrong” answer. Then, yesterday, I saw Moms’ Night Out. I was the odd singleton surrounded by moms’ groups. Now, the movie was really cute and unabashedly Christian. (That’s kind of refreshing sometimes.) And there’s a mom in the film who feels very similar to the one in The Lovely Bones. The mom in the movie makes it clear that having kids was something she really wanted, but she’s just not happy. The mom in Moms’ Night Out feels a similar sense of drowning, of never measuring up, of missing everything good in the chaos, and of making mistakes. A lot of them. The mom in The Lovely Bones leaves. She decides she’s inadequate. The mom in Moms’ Night Out decides that she’s been equipped. Every day might not be sunshine, but she’s doing the best she can, she’s loving her kids, and she’s spending her afternoons in the pool, figuratively. Oh, I know you’re not supposed to compare moms. I don’t mean this in any malicious way. Both stories have their place. Also, the mom in The Lovely Bones went through A WHOLE LOT, and I don’t even begin to know how I would handle something like that. But I do think that mother represents this question in culture of moms. Both of the moms in the stories ask the question of what do you do when things get rough. One mom leaves. The other stays. I know my mom must have some of these feelings. It’s a mom thing, right? She would never tell us (or show us) that, but I think it’s normal for moms to feel like they’re screwing up their kids’ lives. But it’s incredible thing when you get a mom who not only chooses to stay every day as the wrangler of four children, but who also chooses to have fun with it all too. She’s the perfect mom for me, and I can’t believe I’ve been so lucky to have her. I know it’s not always easy. I know sometimes you feel like a failure. Or you feel like you’re kiddos are sucking every ounce of fun right out of you. Or your kids are truly sucking every ounce fun out of you. And doing the best you can means you’re the perfect mom for your kids. So breathe and get to the pool most afternoons, figuratively (and literally, when you can). Or ocean. Ocean works, too.